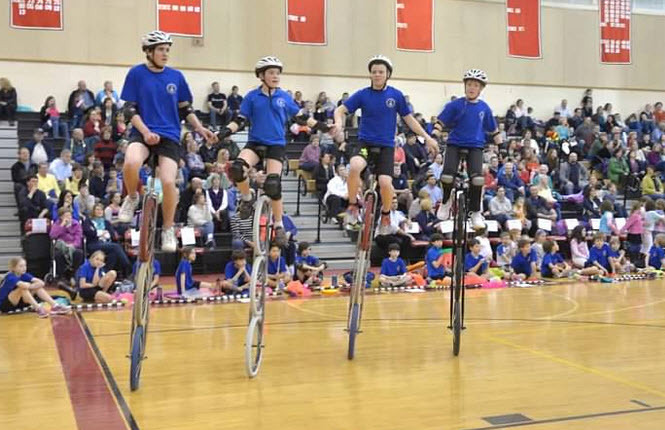 The Gym Dandies Children’s Circus is the perfect performance based assembly for schools. The Gym Dandies have performed at countless schools and community events in the region, bringing the wonder of the circus with the enthusiasm of young performers to young and old alike. The children performing are 3rd through 12th grade students from Scarborough, and are highly skilled. Typically 20-30 children are featured in a performance. During the performance, they showcase a variety of circus arts skills: rolling globes, Chinese stilts, unicycles, bolo boards, juggling: balls, rings, clubs, devil sticks, diablos, spinning plates, and more. The culminating routine features the whole group, each performing atop a six-foot unicycle. Performance Duration: Approximately 60 minutes in length, which can be adjusted according to time constraints. Recognized as an exemplary program for children by the Maine State Arts Task Force 1984. Nominated for the National Education Association Excellence in Education Award in 1991. Since1981, more than 2000 Scarborough school students have been members of the group. The Gym Dandies is the largest continuously operating children’s circus in the United States. Winner of The Governor’s Council on Physical Fitness “Contest for Communities Award” 2000. Featured on ZOOM, the nationally televised PBS children’s program, in 2001, 2003 and 2004. Eighty Gym Dandies represented the State of Maine in the National Independence Day Parade in Washington, D.C. on July 4, 2000. Selected as the featured performance in the Montreal, Quebec Cycling Festival May 2002. This is the world’s largest cycling event. One Hundred Gym Dandies represented the State of Maine in the National Independence Day Parade in Washington, D.C. on July 4, 2004. Sixty Gym Dandies performed atop six-foot unicycles in the Macy’s Thanksgiving Day Parade 2005 in NYC, the largest and tallest unicycle ensemble to perform in this event. The Gym Dandies once again represented the State of Maine in the National Independence Day Parade in Washington, D.C.on July 4, 2006. The Gym Dandies Children’s Circus represented the Scarborough community and the State of Maine in the Parade of the National Cherry Blossom Festival in Washington, D.C. on April 12, 2008. Winner of the Specialty Unit competition, West Virginia Strawberry Festival Parade, April 2009. Winner of “The Peoples Choice Award”, Maine Lobster Festival Parade, August 2010.